When he first meet The Kid, he is holding a hair in the sort of back-alley poker parlor where every guy’s nickname is Buck and there’s enough rusty razor blades in the bathroom that one won’t be missed if there’s trouble. 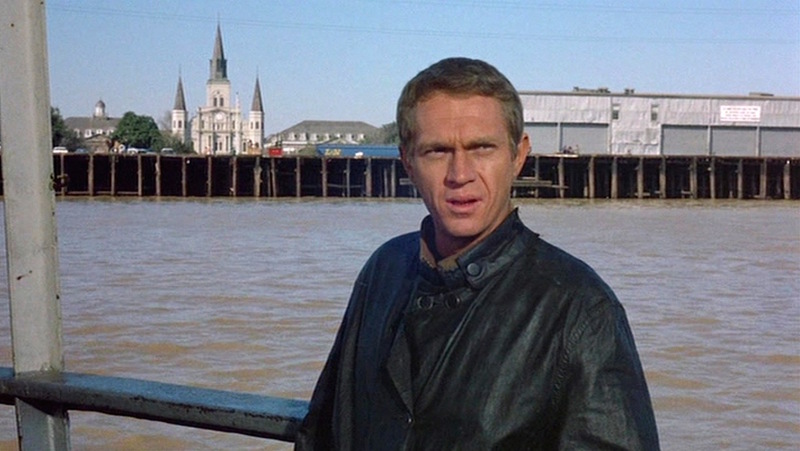 For his day-to-day and game-to-game life in the Big Easy, Eric Stoner wears an oversized black hip-length rain jacket that is often mistaken for leather but actually appears to be waxed cotton, a type of cloth treated with paraffin or beeswax-based wax for its waterproofing properties. 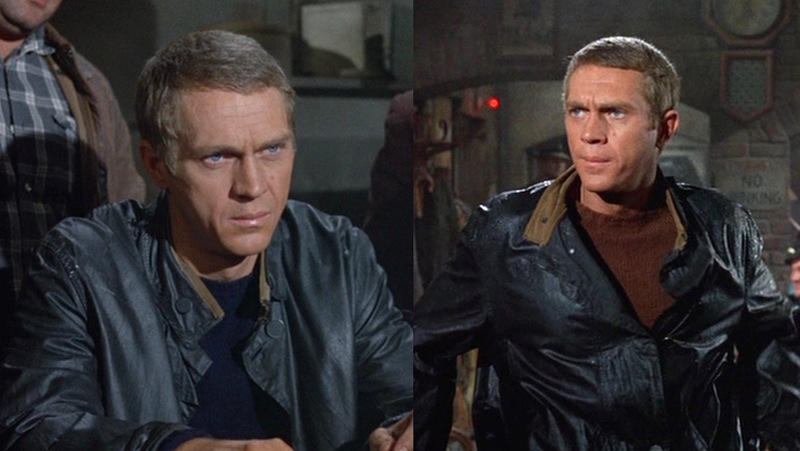 The waxed jacket is a curious choice for McQueen’s character. While waxed cotton’s use for waterproof clothing reaches back to at least the mid-late 19th century, the details and styling of The Kid’s jacket strike me as too anachronistic for the late 1930s. 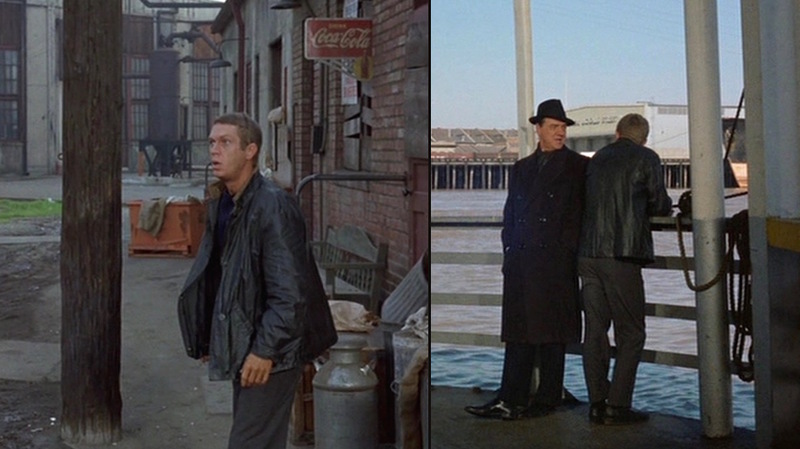 Although the image nicely reflects the countercultural attitudes of both Eric Stoner and McQueen himself, there were certainly many outerwear options of the era that could have evoked the desired “bad boy” image. But he did wear this jacket, so let’s take a closer look at it. The front closes with a very large placket flap with four black-painted metal disc-style buttons that are widely and equally spaced down from the collar down to the bottom hem. Interestingly, the buttons are placed on the “incorrect” side for a man’s jacket; the right-over-left button configuration is much more common (and standard!) on women’s jackets. The Kid gives himself the full New Orleans experience by walking through a jazz-boosted funeral procession. As seen on the left side of his collar, The Kid’s jacket has a large tab that could be buttoned across his neck when it rains… not that he could be bothered with it, of course. It would be difficult to find a jacket identical like this one, as many waxed jackets with standing collars like this also have bellows pockets as opposed to only the simple slant-opening handwarmer welt pockets present on the bottom of The Kid’s waxed jacket. The jacket’s set-in sleeves are most affected by its large size. The jacket is so oversized that the sleeves fall off the shoulder a bit and McQueen cuffs them back over his wrist as they are too long. The cuffs are plain with no buttons or tabs. The Kid shows a preference for crew neck sweaters and wool trousers with his waxed jacket, often matching each garment’s tone to the other by pairing the cool tones of a navy sweater and gray trousers as well as the warmer earth tones of an orange sweater with brown trousers. 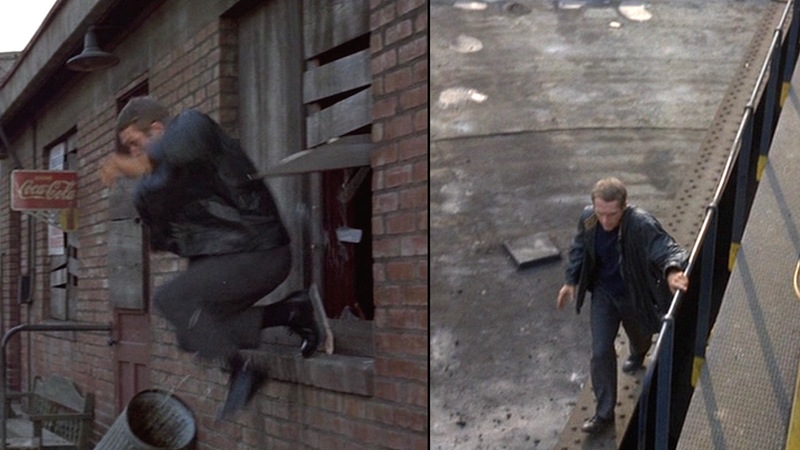 The Kid is first seen wearing this jacket with his navy sweater (left) and later with a rust orange sweater (right). The navy blue cotton sweater has a ribbed crew neck and ribbing on the cuffs and waist hem. As he does when sporting the sweater with his tweed jacket, The Kid pairs it with dark gray wool single forward-pleated trousers. The trousers have a medium-high rise and slim belt loops that he still wears without a belt, revealing the extended squared waist tab with its concealed hook closure. The legs taper down to plain-hemmed bottoms with on-seam side pockets and no back pockets. Like so many of us, The Kid finds a respite from danger in the reassuring company of Karl Malden. The rust orange sweater is slightly nicer, made from a fuzzy wool or possibly even cashmere. 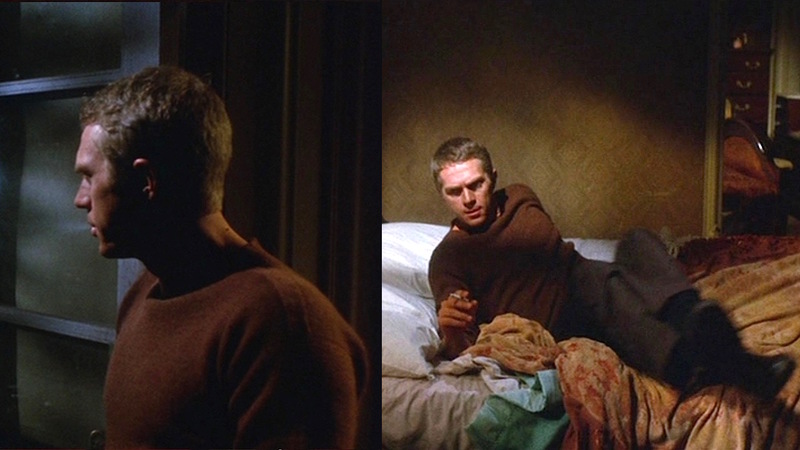 He also wears this sweater with the olive corduroy sport jacket when visiting Christian’s family. With the orange sweater, he wears a pair of brown flannel flat front trousers with tapered legs and plain-hemmed bottoms. With only a lit Lucky Strike cigarette and the low sounds of live New Orleans jazz keeping him company, Eric Stoner contemplates his decisions and his future. The Kid wears his sole (do you get it please?) footwear, a pair of black leather derby shoes. 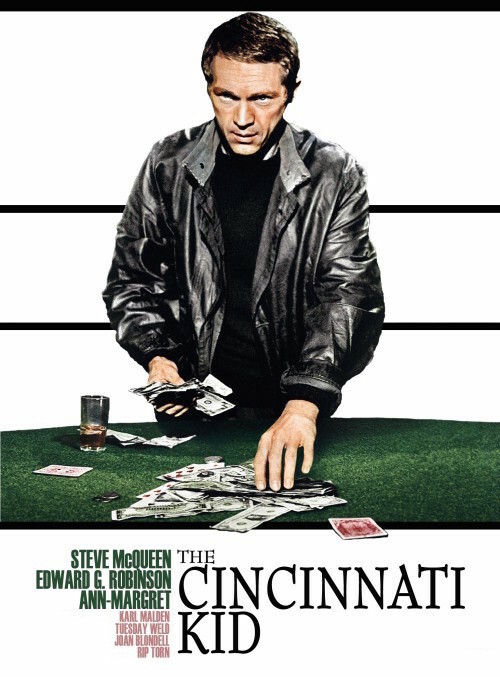 After bluffing his way into a win with only “a lousy pair”, The Kid is once again forced on the run from a sleazy poker game after a fellow player wrongly accused him of cheating. 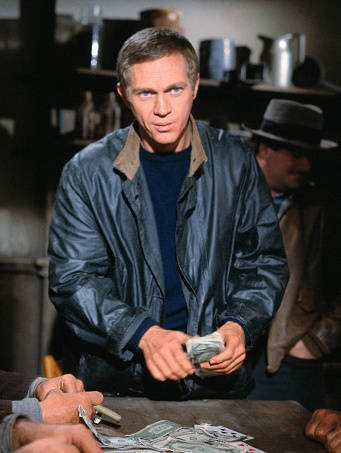 As Eric “The Kid” Stoner, Steve McQueen channels his personal sense of style into a laidback, streetwise Depression-era rounder. To soften the look with earth tones à la McQueen, opt for a muted orange sweater and brown flannel trousers. I don’t need marked cards to beat you, pal. 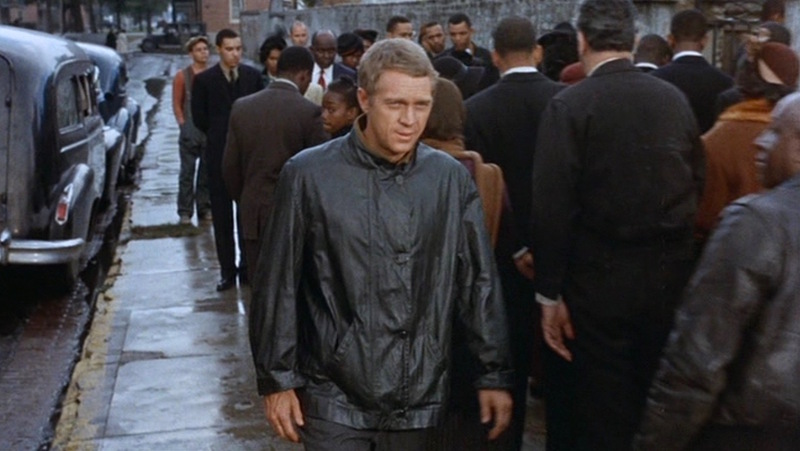 Steve McQueen was reportedly a waxed jacket wearer in real life, having sported a Barbour waxed jacket with the rest of the American motorcycle team during the 1964 International Six Days Trial in East Germany. 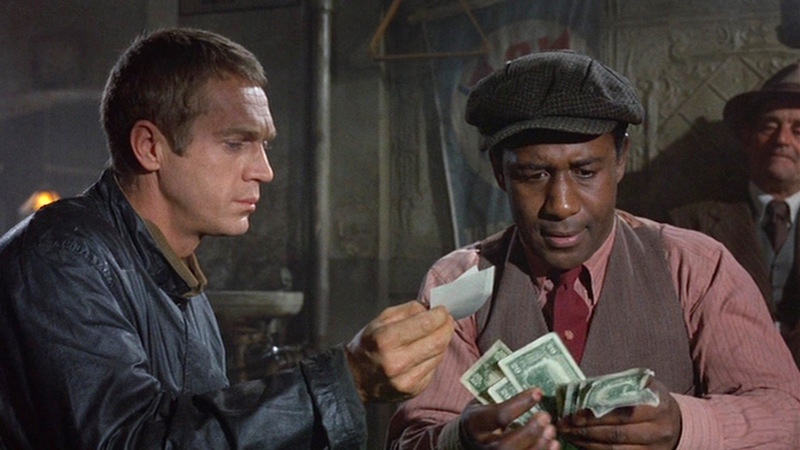 One of McQueen’s teammates was Bud Ekins, the stunt driver whom he had previously worked with in The Great Escape and who would later alternate with McQueen behind the wheel of an iconic hunter green 1968 Mustang in Bullitt.